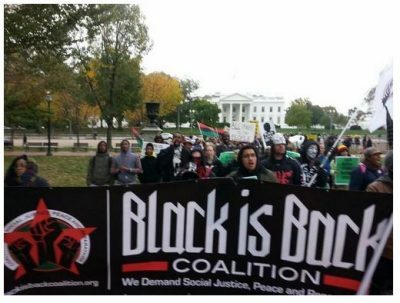 The Black is Back Coalition for Social Justice Peace and Reparations has issued a call for black people to descend on Washington D.C. this weekend for a 2-day mobilization demanding an end to U.S. military and economic aggression in Africa and African communities worldwide. On November 3rd, marchers will gather at Malcolm X Park at noon and march to the White House for a rally at 4pm. Then on November 4th, an organizing conference will be held at the Stuart Center, 821 Varnum Street NE. Eminent domain seizure of nearly 100 acres of land in the black community of St. Louis to construct the “National Geo-spatial Intelligence Station”, a $2 billion international spy station. Escalating police killings of black people in cities across the U.S. The Coalition was formed in 2009 to address the terrible conditions of existence for black people that were not being addressed once Barack Obama took office in the White House and many black activists shied away from criticizing the first black president. The broad-based Coalition is comprised of organizations representing a range of issues and philosophies, unified in their view that the black struggle is a struggle for self-determination. They are calling for black community control of the police and schools, release of black political prisoners, reparations to African people, ending the special oppression of African women and an end to AFRICOM as well as U.S. military and economic warfare against that seeks the political destabilization of other countries like the Democratic People’s Republic of Korea, Syria, Iran, Venezuela, Nicaragua, China and Russia. When/Where: November 3 at noon: Gather at Malcolm X Park and march to White House for a rally at 2pm. Featured image is from Popular Resistance.